Kim Kardashian recently opened up to Vogue about her evolving career and some of the new projects she's been taking on. In the magazine's May 2019 issue, the reality star discussed her efforts for social change and revealed that she's studying to become a lawyer. She was also featured in the outlet's latest 73 Questions video in which viewers get a rare glimpse at the Kardashian-West clan. 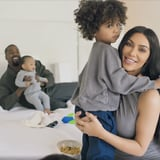 In the clip, Kim is momentarily joined by husband Kanye West and their three kids: 5-year-old North, 3-year-old Saint, and 1-year-old Chicago. (I must say, those kids are freaking adorable.) The ménage of five - that is expecting another addition in early May - spoke with the interviewer about the importance of family and all the lessons they've learned from each other. And if there's one thing that's clear from this video, it's that the Kardashian-Wests share a whole lot of love for one another. Above, watch the family in action and reminisce on some of their shared memories.